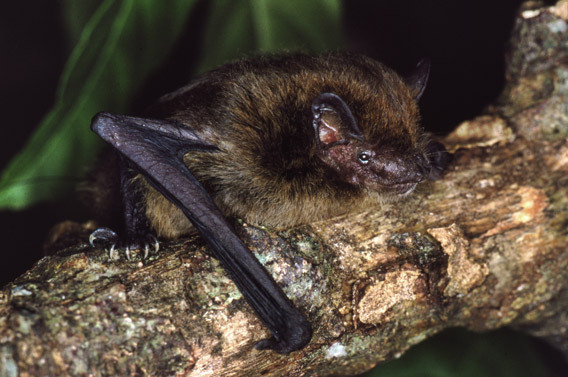 Now extinct: the Christmas Island pipistrelle. Photo by: Lindy Lumsden. Nights on Christmas Island in the Indian Ocean will never again be the same. The last echolocation call of a tiny bat native to the island, the Christmas Island pipistrelle (Pipistrellus murrayi), was recorded on August 26th 2009, and since then there has been only silence. Perhaps even more alarming is that nothing was done to save the species. According to a new paper in Conservation Letters the bat was lost to extinction while Australian government officials equivocated and delayed action even though they were warned repeatedly that the situation was dire. The Christmas Island pipistrelle is the first mammal to be confirmed extinct in Australia in 50 years. 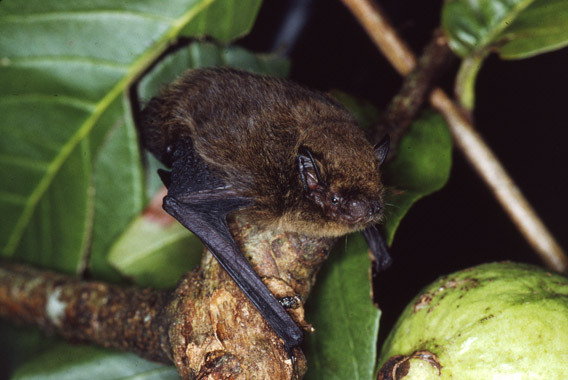 Weighing less than a U.S. nickel, the Christmas Island pipistrelle fed on insects and roosted in tree hollows and decaying vegetation. Just a few decades ago, the bat was widespread on Christmas Island and roosted in groups of 50 or so animals. Once abundant, after the mid-1980s the situation for the Christmas Island pipistrelle took a sudden turn for the worst. Its population began to drop off while the bat vanished from much of its former range. 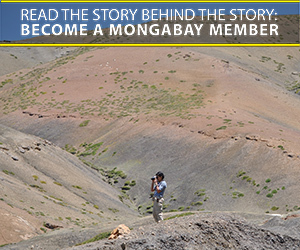 Between 1994 to 2006, the population fell by over 80 percent. But the Australian government hesitated and instead established a committee to consider options. Months passed. In August 2009, Lumsden was finally given permission to capture bats for captive breeding. But by then it was too late. Four weeks of surveying located only a single bat through its echolocation. Researchers were unable to catch it and the bat went silent on August 26th, 2009. “It is quite possible that this is one of the few times that an extinction of species in the wild can be marked to the day,” the entry on the bat for the International Union for the Conservation of Nature (IUCN) notes. While it is possible a colony of bats remains, it’s unlikely giving the extensive surveying by researchers. Scientists still don’t know what pushed the bat to extinction, although there are a number of possibilities, including a slew of invasive species such as feral cats, common wolf snake, and a recent invasion of yellow crazy ants. Disease is another possibility, though researchers could find no sign of the bats suffering from illness. A Christmas Island pipistrelle. Photo by: Lindy Lumsden. So, what went wrong? According to the paper in Conservation Letters a lack of leadership doomed the species. “Leadership has been found to be a key element in the recovery of many endangered species around the world. Without a ‘champion’ to maintain the pressure on governments to act, species will continue to fall through the cracks,” explains Martin, who notes that the leader doesn’t have to be an individual but could be an organization or government team. Martin says that officials could have decided that a captive breeding program was not worth it given so few individuals remaining, and the bat should be let go with scarce resources devoted elsewhere..
“However no such decision was apparent,” Martin say. Instead officials delayed making any decision whatsoever until eight months after warnings. In the end “a lack of brave decision making in the face of uncertainty, and a lack of accountability for stalling decisions contributed to the loss of the pipistrelle,” says Martin. “Monitoring [of endangered species] must be linked to decisions, institutions must be accountable for these decisions and decisions to act must be made before critical opportunities, and species, are lost forever,” Martin says. An orange-bellied parrot (Neophema chrysogaster) male, Melaleuca, Southwest Conservation Area, Tasmania, Australia. Photo by: J.J. Harrison. The orange-bellied parrot (Neophema chrysogaster), according to the paper, shows how bold leadership can make the difference. While the orange-bellied parrot faced a similar situation to the Christmas Island pipistrelle, it has seen a very different, and far more hopeful, outcome. In 1984, the orange-bellied parrot population dropped to around 150 birds. Two years later the first captive population was established, but the bird continued to vanish from the wild. In 2009, researchers predicted the bird would be extinct in the wild in a few years. A recovery team decided within one day to capture more wild orange-bellied parrots to boost the captive population. 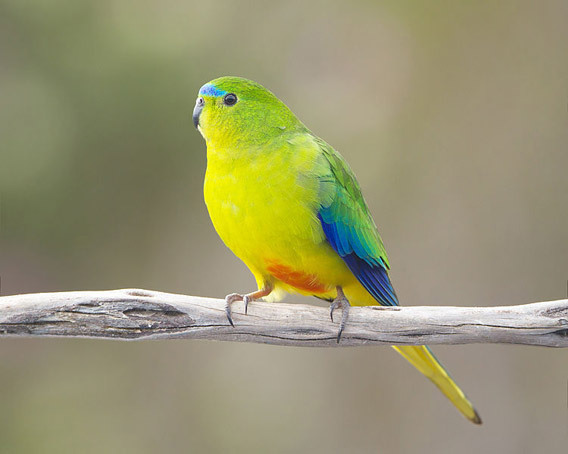 Today there are nearly 200 captive orange-bellied parrots, and the species has a chance for reintroduction into the wild and long-term survival, unlike the Christmas Island pipistrelle. According to Martin the major difference between the orange-bellied parrot and the Christmas Island pipistrelle was that the parrot had a recovery team devoted to its survival, which had been established as far back as 1986. This team closely monitored the parrot over the decades and was capable of taking swift action to save it from extinction. “Recovery teams are an integral part of species recovery success because they act as the ‘champion’ to ensure the decision process is carried through from the information gathering stage to the implementation of actions and monitoring of success,” explains Martin. Part of the problem, says Martin, may be that the public simply likes parrots more than bats, regardless of their ecological roles or importance. While the Christmas Island pipistrelle is gone, Martin says it has left behind lessons for future conservation action. 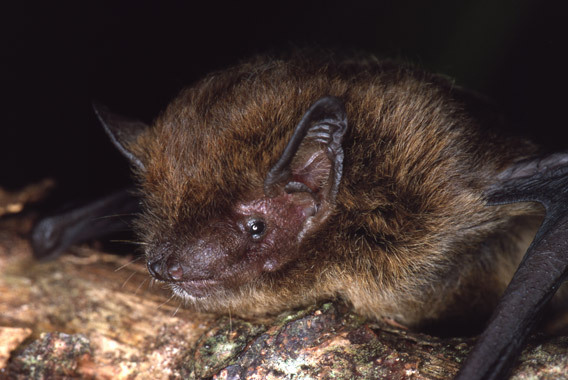 Unfortunately the Christmas Island pipistrelle is now added to an extensive list of mammal extinctions on the island, including Maclear’s rat (Rattus maclean), the bulldog rat (Rattus nativitatis), and perhaps even the Christmas Island shrew (Crocidura trichura), which hasn’t been recorded since the 1980s. With the loss of the Christmas Island pipistrelle, the last remaining endemic mammal may be the Christmas Island fruit bat (Pteropus melanotus natalis), a subspecies of a bat found on nearby islands including Sumatra. & Hugh P. Possingham. Acting fast helps avoid extinction. Conservation Letters. 2012. (11/12/2011) The western black rhinoceros (Diceros bicornis longipes) roams the woodlands of Africa no more. The rhino, one of four sub-species of black rhino, was declared extinct this week by the IUCN, five years after the last extensive survey of its habitat in Cameroon. The rhino becomes the second declared extinct this year. All rhinos are threatened by the rhino horn trade. (11/09/2011) The thylacine, the dodo, the great auk, the passenger pigeon, the golden toad: these species have become symbols of extinction. But they are only the tip of the recent extinction crisis, and according to a survey of 583 conservation scientists, they are only the beginning. In a new survey in Conservation Biology, 99.5 percent of conservation scientists said a serious loss in biodiversity was either ‘likely’, ‘very likely’, or ‘virtually certain’. The prediction of a significant loss of species is not surprising—scientists have been warning for decades that if global society continues with business as usual the world will suffer from mass extinction—what is perhaps surprising is the practically unanimous expectation that a global biodiversity decline will occur. (10/26/2011) In 2009 poachers shot and killed the world’s last Vietnamese rhinoceros (Rhinoceros sondaicus annamiticus), a subspecies of the Javan rhino. The Vietnamese rhino was the last rhino species that survived on the southeast Asia mainland. (10/25/2011) In 2009 poachers shot and killed the world’s last Vietnamese rhinoceros (Rhinoceros sondaicus annamiticus), a subspecies of the Javan rhino, confirms a report from International Rhino Foundation (IRF) and the World Wide Fund for Nature (WWF). The Vietnamese rhino was the last Javan rhino to survive on the Asian mainland and the second subspecies to vanish, following the extinction of the Indian Javan rhino (rhinoceros sondaicus inermis). The Javan rhino is the world’s most imperiled rhino species with now only around 50 individuals surviving in a single park on its namesake island in Indonesia. (10/06/2011) The US Fish and Wildlife Service announced yesterday that the believe two species in Florida have vanished into the long dark night: the South Florida rainbow snake (Farancia erytrogramma seminola) and the Florida fairy shrimp (Dexteria floridana). The species were under review for possibly being added to the Endangered Species Act (ESA), but it’s likely the review came decades too late.